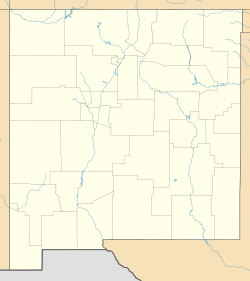 Cordova is a census-designated place and unincorporated community in Rio Arriba County, New Mexico, United States. The village lies a short distance off the "High Road to Taos", NM State Road 76, between Chimayo and Truchas. Its population was 414 as of the 2010 census. Cordova has a post office with ZIP code 87523, which opened on March 26, 1900. Cordova is well known for wood carvers. Cordova was the scene of a serigraph completed 1946-1947 on wove paper, "Street in Cordova, New Mexico" made by noted Oregon born printmaker Norma Bassett Hall (d. 1957) Size 8.875 x 11.5 in. Held in 2015 by the Lockhart Family Collection. It features a view up to the Pecos mountains from a street scene containing a narrow adobe dwelling lined street, three adults and a child, and the rear and steeple of the church. The scene is awash in light with predominant beige and white tones. Great States, an American alternative rock band, has a song entitled "Cordova, NM" on their debut album, Gatsby. ^ a b c "American FactFinder". United States Census Bureau. Archived from the original on 2013-09-11. Retrieved 2011-05-14. ^ "Cordova". Geographic Names Information System. United States Geological Survey. ^ "Postmaster Finder - Post Offices by ZIP Code". United States Postal Service. Retrieved August 29, 2013. This page was last edited on 10 March 2019, at 22:21 (UTC).